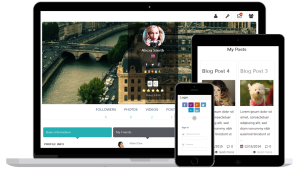 Users Ultra Pro is a flexible network plugin for WordPress, which has the simple goal of being able to create advanced community and network of users for your website. It can be easily integrated with any theme of WordPress you are using and can promise better user experience through its many features and benefits, which will be discussed further later. With this, WordPress Users plugin, you will be able to display all of the active users of a website, and other people can easily connect to these users. One of the best things about this WordPress community plugin is the fact that it offers flexibility. You will not have to be limited with a single membership package as you have the option to choose which one is best suited for your budget and specific needs. The cheapest is the Premium Single Package, which is good only for one site and for one year. There is another Premium Single Membership Package, which is more expensive because it is good for one site but for two years. These two packages are perfect for small businesses with minimal needs. For more advanced developers handling multiple websites, it is better to choose the Premium Unlimited Package for this users management plugin. You can also choose package good for one or two years, depending on what you need. One of the most important features of this WordPress members plugin is the Follow button, which will make it easy for users to follow the activities of other users. With this, they will easily know what the other member has been doing. It also comes with Users Management feature, which will make it easy for you to manage the community of users. Through this, you can accept or reject requests from users, as well as change the status of the membership of the users. The responsiveness of this network plugin is another feature worth highlighting, making it possible to improve customer experience. In a time wherein more and more people are using their smartphones to access the internet; this plugin makes sure the website will not appear distorted regardless of the device that is used. Ease of use is also another important feature of this WordPress users plugin. It is very easy to be embedded on your website. It comes with an easy to navigate admin panel for ease of website management. In the same way, members of the community will also find it easy to use. It even has social connect buttons to allow them to sign in through their social media accounts. Whether you are part of the admin or the community of users, there is no doubt how this network plugin can contribute to a favorable experience to make any website perform better than others. Consider using this plugin and change the way your website delivers experience to its users.